Everest Base Camp is either of two base camps on opposite sides of Mount Everest. South Base Camp is in Nepal at an altitude of 5,364 meters, and North Base Camp is in Tibet at 5,150 meters. 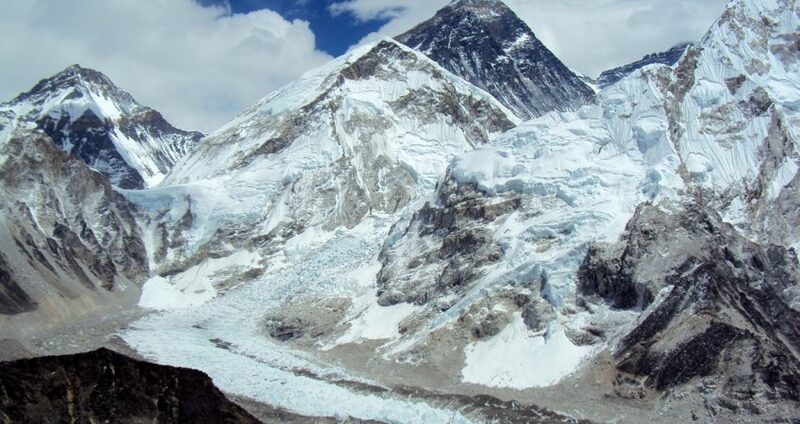 Everest base camp trek is one of the finest trekking destinations in the world, where you not only get to see the world’s tallest peak, Mount Everest but many other high peaks of the world such as Makalu and Lhotse. Trekking to the Everest Base Camp (EBC) is always the favorite among every adventure enthusiasts who love to trek. Trekking to the Everest Base Camp facing the south is in the Nepal region and the most popular option for trekkers to reach Everest Base Camp. It is situated on an altitude of 5364 meters. This trekking route is of moderate difficulty level and few instances will be very strenuous. This will be a challenging task and the key over here is your patience level and not your fitness level. People with average fitness level will be able to it successfully; after all it is a trekking to the Everest Base Camp and not climbing the Mount Everest. Our guides, porters will take care and ensure that you are able to reach on your speed, let it take the time of its own. Our trekking expedition will cover the below famous points apart from many other. Namche Bazaar, Namche Museum,Tengboche Monastery and The oldest Sherpa Village on the highest peak. We will get to see the Mount Lhotse, Mount Ama Dablam, The Imja Valley, Mount Makalu, Mt Cho Oyu, Mount Pumori, Mt Nuptse, Mount Cholatse , Mount Thamserku, Khumbu Glacier, Khumbu Icefall, Khumbu Tse, Lingtren, Mahalangur, Everest Base Camp and a trek to top of Mount Kala Patthar. You will get a panoramic view of the Himalayan Ranges from the Mount Kala Patthar, including the complete view of the Everest. Trek Begins and Ends at: Kathmandu. Trekking Duration: 14 nights / 15 days. Difficulty level of the Trek: Medium to High. Total Trekking Distance: 120 Kilometers (both sides). Maximum Altitude Gain: 5,644 meters. Daily Altitude Gain: 200 to 400 meters. Type of Accommodation: Hotel or tea houses on a twin sharing basis. Day 09: Lobuche to Gorakshep (5170 meters) to Everest Base Camp (5364 meters) & back to Gorakshep. Airport pickup and drop for international terminal.